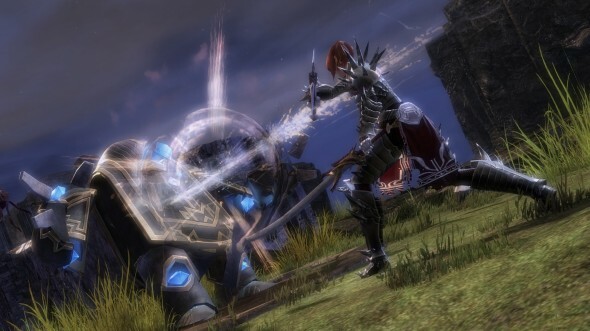 As we said in our last blog post, we’ve just seen the tip of the iceberg for sPvP. Custom Arenas are still being worked on and when they’re ready, we’ll show you more. In the meantime, there are a number of new features coming to PvP. Qualifying points (QPs) are gained in paid tournaments – each person on a winning team in an 8-team paid tournament gets 1 qualifying point. QPs lead to rankings for larger tournaments, and allow you to measure yourself against other players. Because you must have a full team in order to join a paid tournament and it takes tickets to enter, we know that the best teams will be playing paid tournaments. So while you do compete for better prizes than in free tournaments, the thing you’re really competing for are QPs. 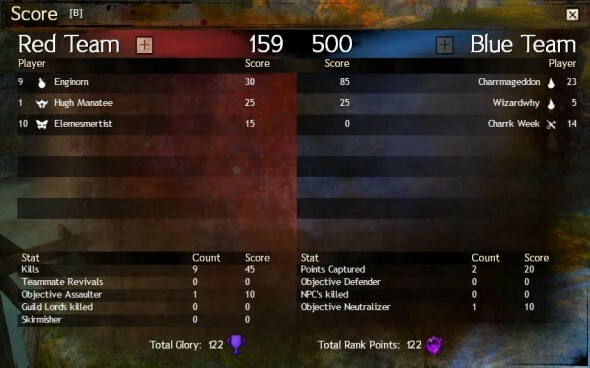 Think you’re actually good at competitive GW2? Hit the paid tournaments and prove it. We’ll be adding more features that build off QPs, so once that’s ready, I’ll give everyone another update! To make it easier to get into sPvP, we’ve made some User Interface (UI) adjustments. 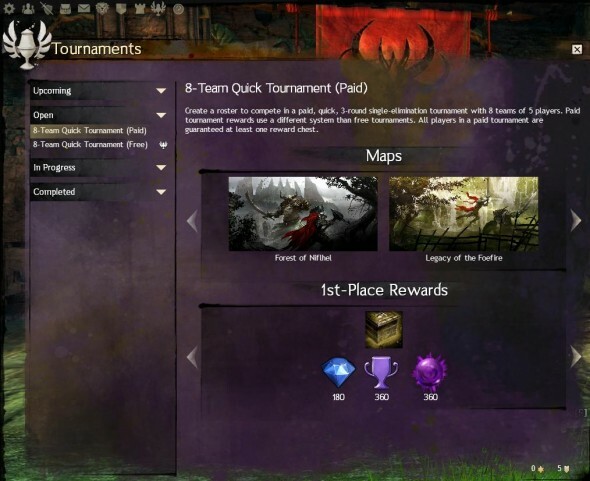 The tournament browser UI now shows you the map rotation for a given tournament, as well as the rewards. You can now join and leave structured PvP by using the crossed swords button in the upper left of your screen. This opens a panel that shows your sPvP stats and info about your character. The scoreboard now shows player ranks at the end of a game. It’s another way people can see how awesome you are at sPvP. So that’s it for now! We’re still working on other features in addition to custom arenas which will support sPvP, and once those are ready to go, we’ll do another update!